TV presenter Clare Balding has been sharing her Olympic and Paralympic stories with more than 150 school children in Northampton. She gave a talk at Paralympic gold medallist, Ellie Robinson's, primary school in the town. Clare Balding is visiting schools across the country to promote her new book. Social media feeds have been awash with messages of support for Max Whitlock and Laura Trott after their awe-inspiring performances in Rio. Paul Evans , who was in the 10,000 metres final in the Barcelona Olympics in 1992 and 4 years later in Atlanta, is running a summer track and field camp at the UEA Sportspark in Norwich. Athletes from across the country are currently battling it out to secure a place in the Olympic games in Rio this summer. 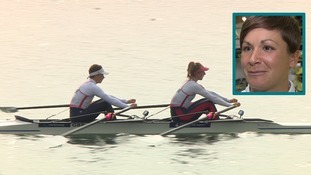 ITV News has been given rare access to the rowing squad training ahead of the European Championships next month including Bedfordshire hopeful Charlotte Taylor. Many of those competing in that event will travel to South America to represent Team GB and contribute to the Olympic medal tally. Two sailors from Norfolk and Cambridgeshire have been added to the Olympic team for Rio 2016. It's a year to the day since the opening ceremony of the London Olympics. The games were the highlight of a glorious summer of sport, with Team GB finishing third in the medal table. There were plenty of successes here in the East. But a year on, some sports are counting the cost after missing out on funding for the next games in Rio. Donovan Blake has been focussing on volleyball, which has its national centre in Kettering. Cambridgeshire athlete Robbie Grabarz preparing for his race experience day at Rockingham Raceway near Corby. The Olympic bronze medal winning high-jumper was taking time out from his preparations for the outdoor athletics season. The National Brazilian Gymnastics team are in Ipswich as part of a 2012 legacy project being run by the town's gymnastics centre.